Six years of zero rates and trillions of dollars of asset purchases couldn’t stop stocks from falling sharply on Wednesday. All three major indices moved deep into the red, with the Dow Jones leading the pack, dropping an eye-watering 460 points before rebounding nearly 300 points by the end of the session. Risk-free assets, particularly US Treasuries, rallied hard on the flight-to-safety move with the benchmark 10-year Treasury yield slipping to a Depression era 1.87 percent before climbing back above the 2 percent mark. US financials were the worst hit sector, taking it on the chin for 9 percent by mid-day, while Brent crude was soundly walloped, falling to a 47-month low on oversupply and deflation fears. Stock market gains for the year had nearly been wiped out before a miraculous about-face turned Armageddon into a so-so day with survivable losses. Even so, analysts have already started paring back their estimates for 4th quarter growth while traders stocked up on antacid for Thursday’s opening bell. The proximate cause of Wednesday’s bloodbath was weaker than expected economic data from Europe–which is sliding towards its third recession in five years– droopy retail sales in the US, and a report from Department of Labor showing that wholesale prices for producers are edging closer towards deflation, the opposite of what the Fed is trying to achieve via its aggressive monetary policy. “Six years after the global banking system had its near-death experience, interest rates are still at emergency levels. Even attaining the mediocre levels of activity expected by the IMF in the developed countries requires central banks to continue providing large amounts of stimulus. The hope has been that copious amounts of dirt-cheap money will find its way into productive uses, with private investment leading to stronger and better balanced growth. 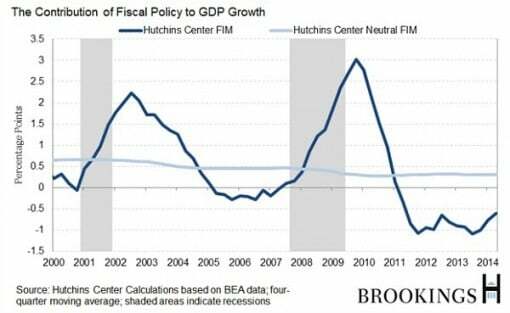 “Welcome to Austerity U.S.A., where the deficit is back below 3 percent of GDP and growth is still disappointing—which aren’t unrelated facts. Sounds ominous, doesn’t it? And Hussman is not alone either. The bearish mood on Wall Street is gaining pace even among those who focus more on geopolitical issues than fundamentals, like the Bank for International Settlements’ Guy Debelle who said in an interview on CNBC on Tuesday that he was concerned about the possibility of a “violent” market drop, particularly in bonds. But stocks aren’t cratering because of tensions in the Middle East or Eastern Europe. That’s baloney. And they’re not falling because of decelerating global growth, plunging oil prices or Ebola. They’re falling because no one knows what the heck is going to happen when QE stops at the end of October. That’s what has everyone in a lather. Keep in mind, that 20 percent of the current market cap (more than $4 trillion) is stock buybacks, that is, corporations that have bought their own shares to juice prices. Do you really think that corporate bosses are going to play as fast and loose after the Fed stops its liquidity injections? Not on your life. They’re going to pull in their horns and see what happens next. And if things go sideways, (which they very well could) they’re going to cash in and call it a day. That’s going to drive down stock prices and send markets reeling. “(Abigail) Doolittle, founder of Peak Theories Research, has made headlines lately suggesting a market correction worse than anyone thinks is ahead. The long-term possibility, she has said, is a 60 percent collapse for the S&P 500. In early August, Doolittle was warning both of a looming “super spike” in the CBOE Volatility Index as well as a “death cross” in the 10-year Treasury note. “CNNMoney’s Fear & Greed Index is a good indicator of market momentum. Today it hit zero. That’s a huge red flag and showcases extreme fear in the stock market. The only other time the index ever touched that low point is in August 2011 — shortly after Standard & Poor’s downgraded the U.S. debt. So fear and volatility are back, but liquidity has suddenly gone missing. That sounds like a prescription for disaster to me. So what can we expect in the weeks to come? Did he say “forced deleveraging”? Uh huh. So, after a 6 year bacchanal, the Fed is finally going to take away the punch bowl and force the revelers to pay down their debts, clean up their balance sheets, and take a few less risks. Is that it? Yep. It sure looks like it. But, that could change in the blink of an eye, after all, the Fed has its friends to think of. Which means that Ms. Yellen could announce QE4 any day now.